ladies and gentlemen, several hours ago whilst watching cartoons i chanced upon something which will shake you to your very core. if you're standing up….sit down. if you're sitting…thats fine, continue doing so. ladies and gentlemen. this ones big. forget about everything you think you know. that whole da vinci code thing? thats small potatoes compared to this. im frightened what might happen to you if i just blurt it out. the human heart is a delicate thing after all. i'm going to let you just chance upon it the way i did. some of the brighter ones of you may make the connection by the time i'm finished. there. two favorites. two very different favorites. one from the distant past. one from the distant future. two lives unnconnected in every way. two lives seperated by the gulf of time. time ladies and gentlemen. time. these people are a mrs wilma flintstone and a mrs jane jetson. ladies and gentlemen i shall now post two more pictures. if you've stood back up, then sit back down. if you're still sitting, thats good, continue to do that. ladies and gentlemen several of our people have been working all morning on these digital mock-ups. you will notice that we have changed the pictures in some way. let me be your guide. its the hairstyles people. we have very carefully altered the hairstyles in each picture. you will notice that wilma now sports an orange yak style with centre parting and jane a red bouffant with a tightly tied bun. at this stage nothing seems untoward does it? your wondering where im taking this arent you? your thinking this guys got nothing. faith people. have a little faith. im now going to put up two more pictures. again. let the master lead you. ladies and gentlemen through careful pixel by pixel alteridge my boys have changed the dress wear on the two different ladies. in the second picture i had one boy work overtime and give the picture a little nose job and a chinbone shave. now look closely. closer. dart back to the original photos if you need to. look look. my god readers! open your eyes! they're the same people! 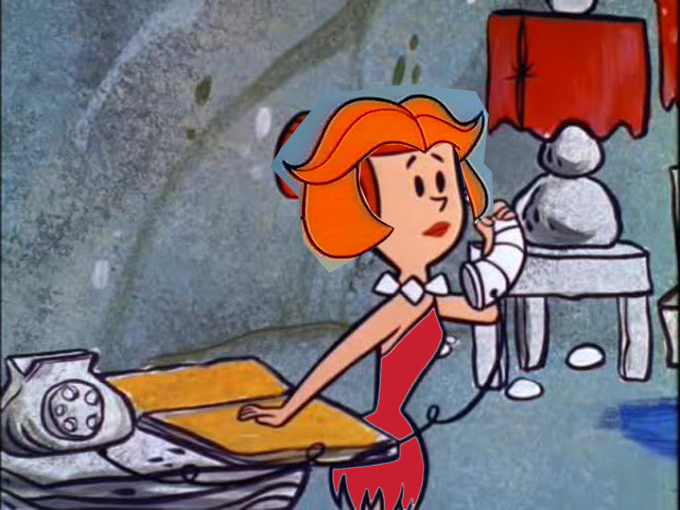 wilma flintstone is jane jetson……JANE JETSON IS WILMA FLINTSTONE! THEY ARE THE SAME PEOPLE! IT IS ONE PEOPLES! NOT TWO DIFFERENT PEOPLE! my god! look dear readers. within those cold dead eyes lies a million secrets. what made jane become a time traveller? when did she discover she could bend space and time? what is her purpose? what are her aims? 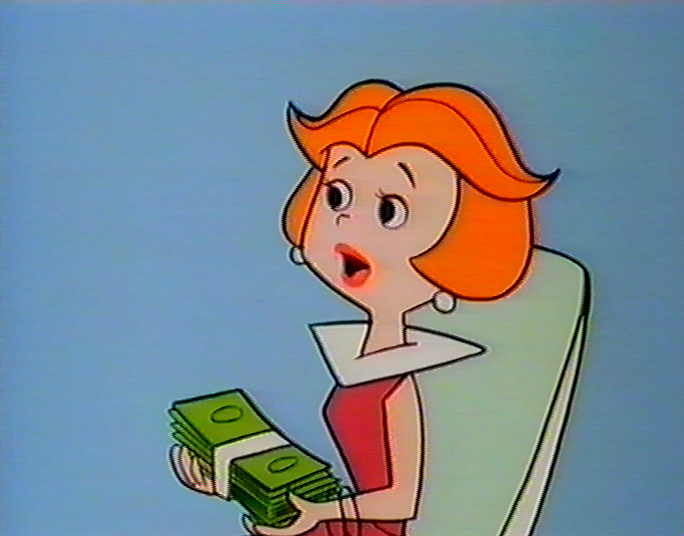 does george jetson know his wife is shared with fred flintstone? 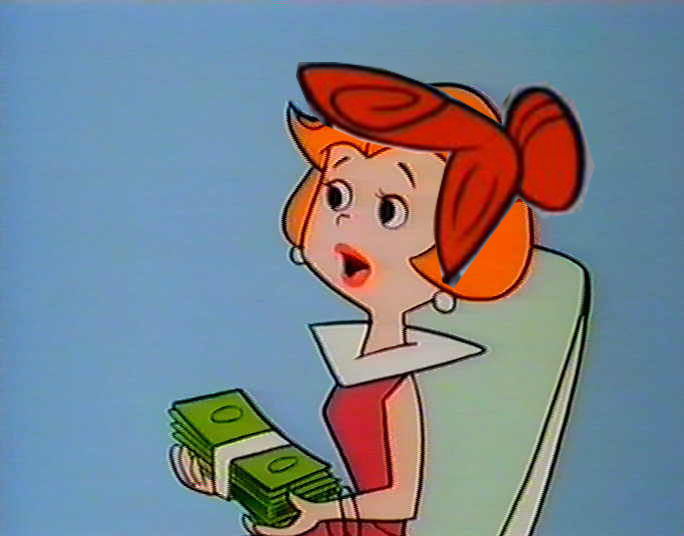 do judy jetson and elroy jetson know they have a half sister pebbles flinstone? 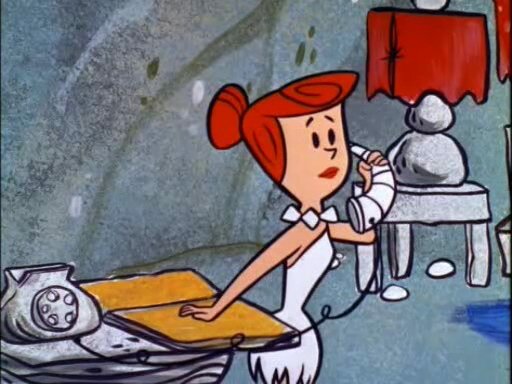 why does wilma aka jane prefer the off the shoulder dress in the stone age? is she jumping all through time like sam beckett in tiresome quantum leap?. righting wrongs that need to be righted? where else has she been? what courses of history has she changed? is she a source of good or is she a tool of evil cropping up in every key event in history, changing, altering, meddling? 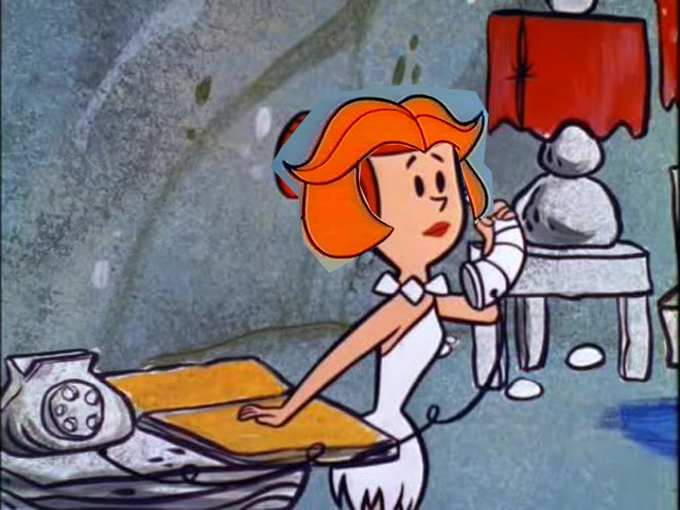 whats your story mrs flintstone??? WHO ARE YOU FLINTSTONE??? WHATS YOUR STORY???? its all coming together folks. i had immediately assumed time traveller, what with jane having access to all those spacely sprockets where george jetson worked. how stupid of me. in fact the real truth is far more fiendish. 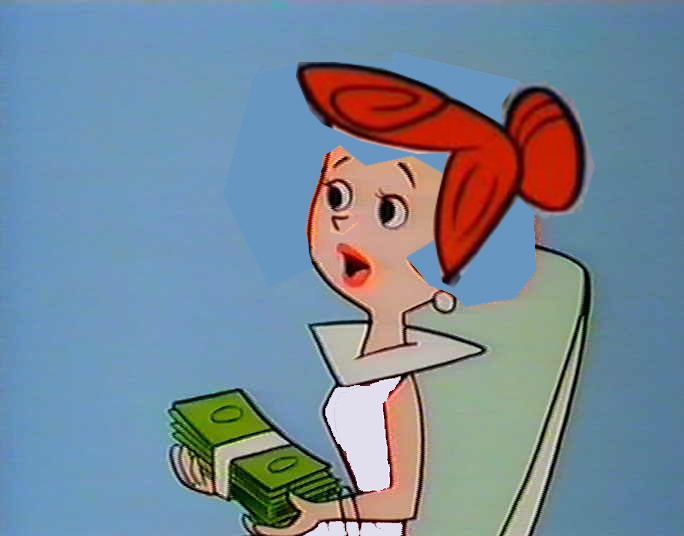 jane jetson is in league with the devil! i cant take the credit for spotting it. it was witchfinder general six bucks who smelt the work of the undead here. look the evidence is there. 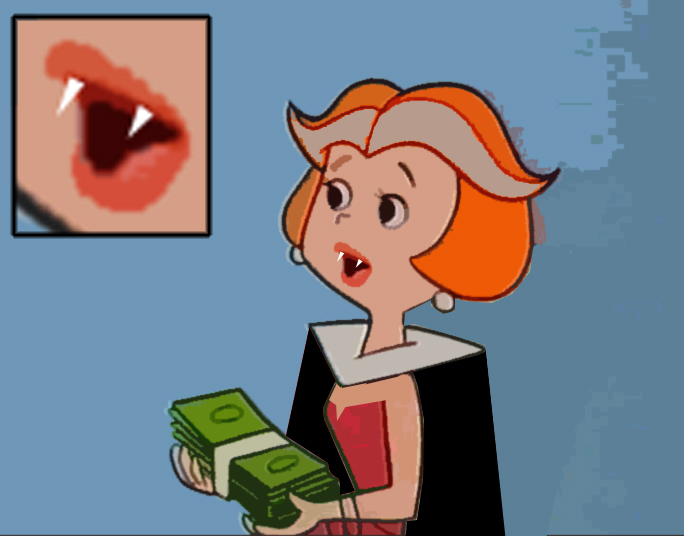 the pointy teeth, the impossibly fixed hairstyle, the cape and of course the money. it is well known that vampires use money to buy things. she has obviously been feeding on human blood. sucking the life force from her victims in order to span all these years. burn the witch! Perhaps she is a vampire. That would explain her youthful appearance over the millennia. mein gott! i think you're onto something there! the fiend! jane jetsons hair does look a lot like gary oldmans in dracula. ¿usted no ha conseguido nada mejor hacer que su tiempo en nuestra computadora de los padres? ¡usted está en el país sale y abraza un árbol! Es el libro bajo wilma jane's mano un lista de alma reivindicado por el diablo? Your find of the centuries made [TIG]! Now the entire Vox world will read and appreciate your brilliance. So what should we do now? Now that you have revealed Wilma Jane's secret, what course of action must we take? The Crimson Cornflake is on your side and ready to defend humanity from this terror. Good god. To think that without the marvels of modern computer technology, this dark secret might have gone unrevealed for another 10,000 years. It's true what you see on CSI–they really can do amazing things with digital graphics! i think we should all start storing garlic Crimson Cornflake. get your scarlett cape and boots out the wash. this cartoon horror could strike at any time. we'll all sleep easier knowing you're on the job. cloning! i never thought of that. oh the horror. an army of red headed female vampire cartoon characters. best stay indoors till it all calms down. and thats my trained monkeys just working on these helpful graphics for a few days redzilla. think what could be accomplished in a whole week! or even a year!. i think we could knock out an informative leaflet by 2009, with pop-up bits and everything. [this is magically delicious] This is, perhaps, my most favorite VOX post, EVER. Like, EVER. Oh, calm down everyone! It's long been known that Kazoo spent a lot of his energy transporting Wilma to and from the distant future. It makes complete sense that while on one of her escapades, she was cloned and one of her decided to stay there. I'm not so sure about the fangs, though – could be that something went wrong in the cloning process. I'm not even sure which one came back – the clone or the original. Okay, be a little scared.